Heresy Corner is a place where we are encouraged to look beneath the surface of events for some deeper sort of meaning; to think beyond headlines and to reach further than the first cliché to hand. It’s not the contributors’ fault that the Church of England so often appears determined to confirm clichés about itself. ‘Apologetics’ ought to be about explaining Christianity, not, as it often turns out to be for people like myself who wander incautiously into hostile territory, apologising for Christians and their statements. I am charged with speaking to groups of English Christians Sunday by Sunday, and feel I have to remind them that, despite what they may think, they aren’t being persecuted. On the contrary, Anglicans, at least, retain a great many privileges which are very useful to the Church even as they are utterly unjustifiable on any other grounds. But Christians like to feel got at, because it reinforces their sense of authenticity as courageous followers of their Lord, speaking the truth and hated by the world. They don’t, in general, like to be reminded that in almost every important respect they are completely indistinguishable from their unbelieving neighbours. But Christians in Britain are embedded in a great ideological reorientation, a shift in what sort of people hold power and how they think of themselves and their nation. Those people are no longer, in the main, Christians of any description or degree, no matter how far the symbolic discourse of the State – the monarchy and the established Church – expresses Christianity, and in fact one brand of it. Instead an unbelieving polity is struggling to work out how to accommodate believers of different kinds, oscillating between two broad approaches. The first, which might be termed ‘soft secularism’, is relativist in its attitude to religion, and thinks of religions as cultural products which need acknowledgment and protection in the same way a local authority might slap a preservation order on a familiar and picturesque but obsolete building. The second, ‘hard’ form of secularism instead sees religions as rival, and absurd, ideologies which are threatening to its own outlook and which, were they left to express themselves as they would like, would damage the whole peace of society. The Church of England’s approach in this situation needs to be particularly adroit, not to say acrobatic. Its institutional privileges and control of the symbolic identity of the British State represents the last sense in which Britain can be described as a ‘Christian’ country, but that very position brings it face to face with the nation’s new, mainly non-Christian ruling class. It’s a creative juxtaposition, to say the least. There doesn’t seem any neat and tidy way of resolving these conflicts. The secularists see the remaining public role of the Anglican Church as offensive. Believers of all kinds think of themselves as being forced to defend signs of their identity (signs of identity, mind, not the thing itself) from petty and ideologically-motivated restriction by businesses and public authorities, and every victory – always couched in the finally self-deluding terms of self-expression – infuriates the secularists even more. What is dangerous to social peace is not the existence of faith schools, nor the defence of a secular public space, nor even the presence of Islam, which is not, pace the Daily Mail, that much of a problem, though one can foresee circumstances in which it might become so. What really is dangerous is that everyone now seems convinced that everyone else is intent on persecuting them, rather than on getting on with them sensibly, and will repress them and their identity if given the chance. A conflict over power can turn the trajectory of a society downward towards legalism and fear; and from fear it’s a small step to violence. Given that the Christian Church maintains that the chief attribute of its God is caritas (translate that as you will) it is not only tragic that Christians are involved in that process, when we should be a major force pulling in the other direction, but close to blasphemous. The instinct Christians continue to exhibit to want to control the lives of those around them shows that the process of purging the Church of its own wille zur macht has a long way to go. Religiously speaking, I suspect that is what God is up to as these great shifts take effect. Rowan Williams gets his fair share of contempt and derision from the Heresiarch’s heretics, but at least he appears to recognise these trends. The best of his writing focuses not on the demands and commands of power and truth, but on trust, worth, care, perseverance, and receptiveness to the other. These are proper concerns for the pastor of a powerless Church in a secular culture, however much this course enrages the public loudmouths demanding pre-digested headlines (never mind, they still have the Bishop of Rochester). 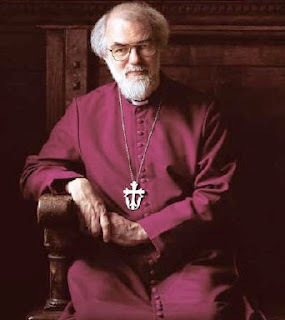 It may be Fr Williams’s great achievement that the recent Lambeth Conference followed his (very quiet) lead, and left the traditionalists who chose not to attend looking less like the doughty champions of Christian orthodoxy they think themselves, than self-important would-be authoritarians guilty of neglecting the most basic of their Lord’s commands. It also left Bishop Gene Robinson and the radicals as their mirror-image, bleating on the sidelines about how wicked the traditionalists are while the majority got on with the business of praying, listening and thinking together. What ends up being included in the eventual ‘Anglican Covenant’ is less important than the general recognition that common fellowship among the world’s Anglicans is a prize worth some self-sacrifice on everyone’s part. This is striking. For perhaps the first time in history a Church has explicitly begun to realise that if one party within it wins, everyone loses. But if the Anglican Communion as a whole is more inclined at the moment to listen to its titular head, what about the Church of England itself? The recent debate on the provisions to be made for those of its members opposed to the consecration of women as bishops revealed a progressive majority in the Synod prepared to ignore the advice of its two supreme pastors, the Archbishops, in favour of a winner-take-all approach. The decision curiously reflects within the Church’s own walls the ideological conflict in wider British society, one which Christianity is not strongly placed to win, if ‘winners’ there must be. The internal victors in the Church of England had better hope they get treated more charitably by a secular society than they seem inclined to deal with their own opponents. About the Christian need to feel "got at", I bow to your superior knowledge - and honesty. You say that the official recognition currently being granted to religious groups is "soft secularism", produced by an "unbelieving polity struggling to work out how to accommodate believers". Yet much of the "faith agenda" - to me at least - seems to have been a personal project of Tony Blair who was, as is often stated, the most overtly religious prime minister since Gladstone. He got it into his head after 9/11 that the answer to terrorism, social fragmentation and so on was to "engage" with faith leaders, faith "communities" and so on and set in motion an apparatus of official consultation, recognition etc that simply had not existed previously. The unbelieving polity was going about its unbelieving business not worrying very much what people "out there" were believing or not believing. It seems in recent years to have become obsessed with these questions. Do you really think that all this would have happened without the religiously-obsessed Blair at the helm? A secular establishment, you claim, "thinks of religions as cultural products which need acknowledgment and protection in the same way a local authority might slap a preservation order on a familiar and picturesque but obsolete building." But you don't say why the government should have such an attitude. (Of course, in many cases the familiar and obsolete building will BE a church, but I'll let that one go.) What is it about religion that a secular state would want to preserve on cultural grounds? We're talking the apparatus of belief here, not choral foundations, stained glass windows, etc, which might indeed be preserved on cultural grounds. Are you suggesting that the government wants to "preserve" Islam in modern Britain for the same reason they might want to preserve Westminster Hall? That strikes me as a bizarre argument. More plausible, I would suggest, is that the government cynically calculates that the religions - especially those religions that are associated with tight-knit, patriarchal "communities" - can deliver easy votes at elections. I agree with you about the conflicts over power. A lot of that has to do, I would suggest, with the ever-increasing scope of state intervention, the desire of governments to police, control and regulate aspects of society that they simply didn't used to bother about, combined with the increasing legalisation of society - the rights culture, the resort to litigation, etc. The powers that be feel they need to have a position on everything in the country, and having a position is equated to passing a law, to make something illegal or legally required that previously just happened. Religious groups who might just want to be left alone thus find themselves being dictated to by officialdom (who take to new powers like the proverbial duck), but then so does everyone else. A very interesting post. I think H is right about Labour pandering to Muslims for votes in some northern cities and parts of London. George Galloway may be an extreme example of this - 'going Islamist', as imperial types once went native. I am one of those hard-line secularists who see no point to religion outside the private sphere. Faith schools are always going to be deeply offensive to people like me. So are seats reserved in the Lords for what amount to tribal high priests. And, of course, there's the monarchy, with Charlie Boy waiting in the wings to subject us all to a 'erm, fascinating spiritual dialogue' with Islam, Catholicism and for all I know the Raelians. No, before that absurdity occurs we should scrap the established church, and either minimise (Swedenise?) or scrap the monarchy. Firstly, thank you to the Heresiarch for asking me to contribute something: I'm glad to be a 'guest', who is, after all, one who is invited to share table. I'm sure you're entirely right about these questions also being provoked partly by the extension of state competence over other areas of life - particularly an attempt to provide 'meaning' and so a sense of identity which should be nothing to do with state structures. I hadn't considered that very much.